The Blue Ridge Mountains are one of the most eye-appealing, serene, and unique mountain ranges in the United States. It's a part of the Appalachians extending from Pennsylvania to northern Georgia, often spilling into the foothills of the Great Smoky Mountains. This website showcases the book, A Photographic Journey Through The Blue Ridge Mountains, which features many shots rarely seen in the usual "tourist type" brochures and guides. They show off nature's landscape and how it blends in true harmony with the man-made by-ways and parkways. 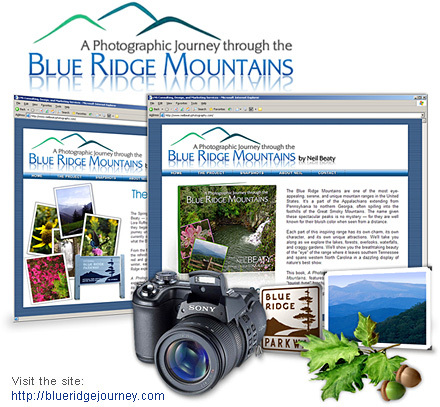 A Photographic Journey of The Blue Ridge Mountains, is expected to publish in December 2008.